The Indian and Pakistani fans seem incapable of dealing with victory or defeat with any semblance of grace. It’s not that all the fans of all the other teams conduct them with equanimity and poise when faced with disaster or triumph; it’s just that when India and Pakistan play, and lose or win, on the fans there descends a joy that maniacal, or sorrow that’s morbid. Bhuvneshwar Kumar, the lad from Uttar Pradesh who swings the ball well, seemed relaxed on the eve of the match against Pakistan. He and Suresh Raina had been out for a bit in the evening, before the rain came pouring down, and managed to remain unrecognised by the Indian and Pakistani fans on Broad Street here. England beat New Zealand by 10 runs in a rain-reduced Champions Trophy Group A match in Cardiff on Sunday. Chasing a total of 169, New Zealand could only make 159/8 in 24 overs. Kane Williamson (67) and Corey Anderson (30) led the chase for a while but got out. For England, James Anderson (3/32) and Tim Bresnan (2/41) scalped wickets. Poor Dav Whatmore, the Pakistani coach, was wheeled out to defend the indefensible after the loss to India. Pakistan lost three matches in a row due to embarrassingly inept batting. Fearing hostile reception after their disastrous campaign in the Champions Trophy, some members of the Pakistan team have decided to delay their departure. Sources in the Pakistan Cricket Board said that only Abdul Rehman, Kamran Akmal, Wahab Riaz, Asad Shafiq and Muhammad Irfan were scheduled to return home on Sunday. Indonesia’s former Olympic and world champion Taufik Hidayat bid an emotional farewell Wednesday to a colourful career that made him one of badminton’s biggest stars in front of a roaring home crowd. England bowler James Anderson has responded to the claims by former captain-turned pundit Bob Willis of ball tampering, labelling them “very disappointing and frustrating” while categorically denying the team are guilty of any wrongdoing. Brazil legend Pele has claimed Cristiano Ronaldo should have won the 2012 Ballon d’Or ahead of Lionel Messi following his efforts for Real Madrid. India suffered a humiliating 1-7 thrashing at the hands of Germany to end their pool engagements on a disappointing note in the women’s competition of the FIH World League Round 3 in Rotterdam on Sunday. The Indian and Pakistani fans seem incapable of dealing with victory or defeat with any semblance of grace. It’s not that all the fans of all the other teams conduct them with equanimity and poise when faced with disaster or triumph; it’s just that when India and Pakistan play, and lose or win, on the fans there descends a joy that maniacal, or sorrow that’s morbid. In that state, the comments that they often make on each other are very unacceptable — they seem to verge on the racist or communal. Sporting rivalries exist through the world. But the history of enmity and war of India and Pakistan, and the nature of the founding principles of the two countries, makes their sporting rivalry unique and often uglier. When India and Pakistan played at the Edgbaston here yesterday, 38 overs were lost to the rain; the Pakistan innings suffered more due to the stoppages caused by the rain. In the end, it was an unequal contest. Before rain stopped play for the one last time in the evening, India needed 94 from about 25 overs; after the resumption, the target was revised to 39 more in 10.3 overs. The writing was on the wall; most of the Pakistani fans, thus, had left by the time the match restarted. There was, thus, no possibility of the fans of the two teams exiting the stands together and rubbing each other the wrong way. The Indians fans stuck until the end, and they were delirious with the win despite enduring a rainy day and a dull contest. The roads were choked on way to the city centre. The fans of the winning team flew the flag from the windows of the car, chanting “India, India” all the way through. Every random brown-faced individual was proffered a hand for a high-five. Moved to display patriotism — for a country they don’t belong to — the Indians in the streets sang “Merey Desh Ki Dharti Sona Ugley”, and “Yeh Dosti Hum Nahin Todenge”. The second number, from the movie Sholey, is almost an ancient song, but it’s the anthem of the Indian fan here. The fans sang this song, from the 1975 movie, in the streets, in the pubs here last evening. There were moments in the ground which were stirring to behold — as when the India and Pakistan flags rose as one when the fans jumped up to create Mexican Waves; or when Yeh Dosti Hum Nahin Todenge was played on the loudspeakers, and thousands of Indians and Pakistanis broke into song. These magical moments were fleeting. In some of the stands, the banter became ugly, as at the Eric Hollies stand where some people seemed to have had drunk more beer than they could handle. Some of them tried to engage Virat Kohli, placed right on the boundary during the later part of the Pakistan innings. Kohli, not a man known for his pacifism, refused to be drawn into anything. He looked back at the crowd and seemed to smile and laugh. Later, filing out of the stands and onto the streets, Indian fans sang: “Who’s got zero points? Pakistan, Pakistan”, “This bus is not going to Lahore”, “Can’t bat, can’t bowl, can’t win — Pakistan, Pakistan”. This continued on the buses and the cabs, and continued well away from the venue of the match. The spirited Pakistanis, who had brought to the ground a yellow and green autorickshaw and drummers dressed in green and white, were left cursing their team. They had been more creative with their wardrobe — among them were Mr Pakistan, King of Pakistan, Sheikh, Doctor and Dictator, all dressed up in fancy, silky clothes. In the end, they were disgusted. 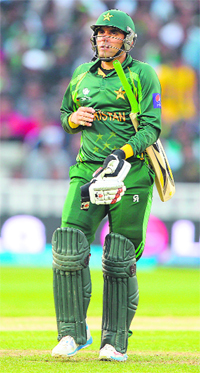 Pakistan captain Misbah-ul-Haq was booed at the end of the match. The team bus, which must wade through the crowd at this stadium, in the absence of a more secure exit, had bottled thrown at it; the players, behind the closed curtains, were shouted abuses at. Invert the result, and the situation would have been opposite — the Pakistan team would have been hailed, the Indian team would have been abused. Bhuvneshwar Kumar, the lad from Uttar Pradesh who swings the ball well, seemed relaxed on the eve of the match against Pakistan. He and Suresh Raina had been out for a bit in the evening, before the rain came pouring down, and managed to remain unrecognised by the Indian and Pakistani fans on Broad Street here. Some Indian fans did say “That was Raina, wasn’t he?”; but Bhuvneshwar was anonymous. Maybe that will change before the tournament gets over. Bhuvneshwar can swing the ball. At the turn of the year, in the series against Pakistan, he had shaped the ball like a banana, surprising the batsmen with guile rather than pace.But here, Bhuvneshwar himself seemed surprised by the fact that there’s less swing to be had than back home in India. Bhuvneshwar, the Man of the Match for his 2/19 in eight overs against Pakistan, said the ball had been swinging more in India. It’s not often that an Indian bowler tops the bowling charts at any stage of an international One-day International tournament. This certainly doesn’t happen abroad, not in the cricket’s premier top-level tournament; then, it’s impossible to imagine a second-choice spinner, picked up essentially for his batting, doing this. Yet, we have Ravindra Jadeja, with nine wickets from three matches, at the top of the bowling charts. He averages 10.77 runs per wicket, well clear of the other man who has taken nine wickets, Mitchell McClenaghan of New Zealand. McClenaghan is playing his fourth match today and could surge into sole lead. We have Bhuvneshwar in the joint sixth position, with five wickets from three matches, average 20. Bhuvneshwar went for a lot of runs against South Africa (49 in seven), but then it had been a high-scoring match; he had given India the breakthrough by removing Colin Ingram, and taken the last wicket to fall, that of Morne Morkel. Against West Indies too, he got the first wicket, that of Chris Gayle, the most dangerous man in the opposition. And he got the first two wickets, Nasir Jamshed and Mohammad Hafeez, against Pakistan. “Bhuvneshwar bowls very good areas, and can swing the ball, he's someone who has given us the early breakthroughs, good to see him bowl well,” captain Mahendra Singh Dhoni said. “I'm pretty much enjoying it here because I always want to pitch up in England because the ball really swings here,” Bhuvneshwar said. England beat New Zealand by 10 runs in a rain-reduced Champions Trophy Group A match in Cardiff on Sunday. Chasing a total of 169, New Zealand could only make 159/8 in 24 overs. Kane Williamson (67) and Corey Anderson (30) led the chase for a while but got out. For England, James Anderson (3/32) and Tim Bresnan (2/41) scalped wickets. Earlier, captain Alastair Cook survived three dropped catches by Nathan McCullum to score 64 out of his team's 169 all out off 23.3 overs. Cook was dropped on 14 and 36 by McCullum, both the chances coming on the leg side from the bowling of left-arm medium-pacer James Franklin. Misbah was the saving grace with the bat, along with Jamshed. Scores of 170, 167 and 165 won’t often win you international matches — certainly not on batting tracks as good as the ones on which Pakistan have muddled along. You can’t expect a coach or a team official to publicly attack his staff or his players; yet, the strong praise that Whatmore accorded Trent Woodhill, the batting coach, was strange and misplaced. In the context of the team’s low scores and being bowled out in all three matches, it was weird. “I thought he did a very good job,” Whatmore said. Good job? The Pakistani media was appalled at this, the rest of the media amused. “Somebody from totally outside the system coming in gives you a nice little breath of newness about it, a different angle, different perspective,” Whatmore went on. “He's a hard worker. I've always enjoyed his efforts, and the relationship was very good. Where he goes from here, it's a Pakistan Cricket Board decision. It would be up to them, and also Trent, as well, to see if there's anything moving forward.” Whatmore went on to say that “we're one ODI victory from having a good series, one ODI, but that's the way it goes”. After three horrible defeats, Whatmore actually said they are “close” to having a good series. At this, there was a loud sound as the jaws of several Pakistani reporters simultaneously fell right to the floor. Figuratively, though not literally, Whatmore placed his hand on heart, and said that he’d been honest all along this brief inquisition. “Well, I've been giving you honesty. I haven’t been saying anything that's not honest,” the coach said. He said this with a straight face — maybe a coach needs to be positive at all times, especially at the worst of times, and maybe Whatmore actually believes or wants to believe that the team would turn the corner easily with one victory. In the aftermath of the crushing defeat to India, former skipper Aamir Sohail has launched a scathing attack on one of Pakistan`s greatest cricketers, Imran Khan, saying the World Cup-winning captain is responsible for the current state of sport in the country. With hundreds of fans cheering “Taufik can” and waving banners that read “Legend”, the 31-year-old played his final professional match at the Indonesia Open, a tournament that he has won six times. While the first-round match ended with his defeat to India’s Sai Praneeth and an early exit from the tournament, Hidayat had not expected to go far against a tough field and still walked off the court a hero to his fans. 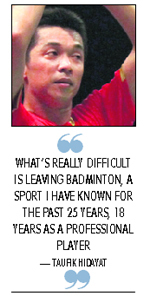 What’s really difficult is leaving badminton, a sport I have known for the past 25 years, 18 years as a professional player,” an emotional Hidayat said. Hidayat, once notorious as the bad boy of badminton who was sometimes compared to outspoken tennis great John McEnroe of the US, showed a much softer side as he prepared to hang up his racket. “Henceforth, I will focus on my family,” he said at the post-match press conference, with his young daughter sitting at his side. He did however admit to being disappointed at losing to Praneeth — ranked 20 places below him — and said he hoped the public would not “judge me only in this tournament”. Hidayat won the first set of the match, which was delayed by several hours, 21-15 with some strong backhand shots and good play at the net. But he began to flag in the second set against an opponent 11 years his junior, and went on to lose the set 12-21. By the final set, Hidayat’s shots were failing to pass the net, and Praneeth won it 21-17. The defeat will come as no surprise, as Hidayat had failed to clinch major titles for several years. His early exit from the tournament is unlikely to overshadow a career that made him into a sporting icon in his home country. With a distinctive, languid style that made the fast-paced game look effortless, he won Indonesia’s first Olympic gold medal at Athens in 2004, famously weeping when he received it, and was crowned world champion in 2005. England coach Ashley Giles refuted those claims yesterday as England prepared to take on New Zealand in their final Champions Trophy group game today as they bid to make the semi-final stages. Anderson told the Mail on Sunday: “As a team we’re really surprised by his comments. Even though there’s nothing to them whatsoever they could stick for a while to us, which isn’t wanted, needed of helpful. “It’s come as a very unwelcome distraction and, frankly, we could do without allegations such as these. Anderson recently broke Darren Gough’s record to become England’s leading One-Day International wicket taker, surpassing his tally of 234 in the victory against Australia. Phil Mickelson moved a step closer to one of his biggest goals, a U.S. Open title, as he emerged from a see-saw third round battle at Merion to take a one-shot lead into Sunday’s final round. Mickelson rolled in a nine-foot birdie putt at the 254-yard 17th hole to leapfrog playing partner Luke Donald, who slipped out of the lead with a bogey on the mammoth par-three. Four-times major winner Mickelson, looking for his first U.S. Open title after finishing runner-up a record five times, bogeyed the daunting 18th hole but still came away with the lead after completing an even-par 70 for a one-under-par 209 total. Sunday could be a dream day for Mickelson, who would add a missing line to his impressive resume with an Open victory as he celebrates his 43rd birthday and Father’s Day with his dad watching him play at Merion. “I’ve had opportunities in years past, and it has been so fun, even though it’s been heart breaking to come so close a number of times and let it slide,” Mickelson said. One shot back after a rousing battle atop the leaderboard were 2011 Masters champion Charl Schwartzel, who posted 69, and Americans Hunter Mahan (69) and Steve Stricker (70). Former world number one Donald, who double-bogeyed the 18th after struggling with the deep rough to finish with a 71, was another shot adrift at one-over 211 along with fellow Englishman Justin Rose (71) and 36-hole co-leader Billy Horschel (72). “It was disappointing and I should have done better,” said Donald, who had taken sole possession of the lead after Schwartzel and Mahan both bogeyed the 17th. Mickelson, the leader after each round, fell from top spot after a bogey on the third hole, but came alive on the back nine with three birdies to fight his way back on a tumultuous day that saw a slew of competitors take turns in charge. The big left-hander said he felt better placed to tackle the challenge of winning the U.S. Open this time around. “I feel better equipped than I have ever felt heading into the final round of a U.S. Open,” said Mickelson, who has three Masters and a PGA Championship title to his credit. Six different players - Mickelson, Horschel, Donald, Rose, Australian John Senden and Schwartzel had turns in the lead over the first nine holes. After the merry-go-round of leaders in the front nine, Schwartzel and Donald settled into a tie for supremacy after the turn and were joined at two-under by Mahan when he birdied the 16th. 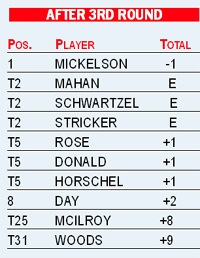 Mahan and Schwartzel both bogeyed the last two holes to yield the top position to Donald, who was then overtaken by Mickelson. Schwartzel said he knows what it will take for him to add a second major title Sunday to his Augusta triumph. “You’re going to have to give every single shot all your attention,” the South African said. Three shots off the pace was Australian Jason Day, who registered a 68 for two-over 212 despite a bogey at the last. One more shot away was Rickie Fowler who carded 67 for the best round of the day. Senden, who briefly led by one, faded with five bogeys in the last 11 holes to post a 74, finishing six strokes off the lead. Tiger Woods and Rory McIlroy, golf’s glamour duo, played together for a third successive day but failed to spark as they spectacularly tumbled out of contention in Saturday’s third round. Between them, the world’s top two players piled up 14 bogeys in challenging conditions, Woods battling to a six-over-par 76, his worst round as a professional, and McIlroy stuttering to a 75. 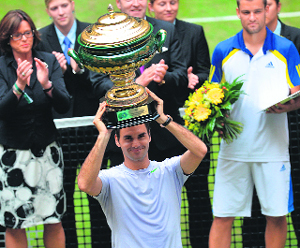 Roger Federer clinched his first title of the season before the start of his Wimbledon defence when he battled back from a set down to beat Russia’s Mikhail Youzhny 6-7(5)6-3 6-4 and win the Halle Open on Sunday. The world number three, who has now won the Wimbledon warm-up event on grass six times, needed to dig deep for his 77th career title and extend his head-to-head with Youzhny to an impressive 15-0. “I was satisfied with my game in the past 10 months. Maybe people thought I was playing badly. That was not the case. I was playing well but when it mattered the others were just better. Today it worked well,” he said. The 31-year-old won three break points in the first game but Youzhny’s powerful serve got the world number 29 out of early trouble. Youzhny held serve and matched Federer’s skill on grass with hammering groundstrokes. Federer, who has now beaten Youzhny five times at Halle since 2002, saved a set point at 5-6 but conceded another in the tiebreak for the Russian to take the lead with a well-placed volley. Federer improved his first serve and refused to buckle, finally getting his first break when Youzhny double-faulted for 5-3 before he served out the second set. Neymar’s stunning early strike set Brazil on the way to a 3-0 win over Japan in the opening match of the Confederations Cup on Saturday although the occasion was marred by trouble at a protest outside the stadium. More than 30 people were injured and 22 arrested as police used rubber bullets and tear gas to disperse protestors angry at the amount of public money being spent on stadiums for the tournament and next year’s World Cup. President Dilma Rousseff and FIFA president Sepp Blatter were jeered before the match at the Mane Garrincha National stadium as the public showed their discontent. Some fans in the 67,000 crowd had to be treated for the effects of tear gas fired by riot police at about 500 protesters outside the rebuilt stadium, which like many other venues has been plagued by delays. On the field, it was plain sailing for five-times world champions Brazil as second-half goals from Paulinho and substitute Jo completed a comfortable win in Group A of the eight-team tournament. Boosted by Neymar’s early strike, Brazil, playing their first competitive match since the Copa America nearly two years ago, dealt competently with the Asian champions who created some nice moves in midfield but lacked punch. The game, featuring the only two countries already sure of a place in next year’s World Cup, came alive after three minutes when Neymar smashed home a right-foot shot from the edge of the area after a long cross from Marcelo was chested down by Fred. That lifted the spritis of the fickle yellow-shirted home fans but they began to show their impatience soon enough as Brazil failed to build on the early goal and Japan came into the match with Keisuke Honda making inroads in midfield. Japan, who started with only Shinji Okazaki as the nominal front man, began to look increasingly dangerous with some incisive moves through the middle but they never seriously troubled goalkeeper Julio Cesar. Despite allowing Japan the room to indulge in some clever passing play, Brazil also showed flashes of flair. Neymar produced a little shimmy on the left, but failed to get past his marker, while Hulk, working up the right wing, fired into the side netting. Fred forced Eiji Kawashima into a fine one-handed save with a low snapshot after a floated cross from Neymar two minutes before the break. Three minutes after the interval, Brazil did find the net again when Paulinho met Dani Alves’s cross and blasted home. The Portugal international had to settle for second spot in the race for the prestigious individual award as the Barcelona star landed the trophy for the fourth year in succession, but Pele believes Ronaldo would have been a more worthy winner. Pele then went on to discuss the transfer of Neymar from Santos to Barcelona and he thinks his compatriot could have some problems adapting to his new surroundings. 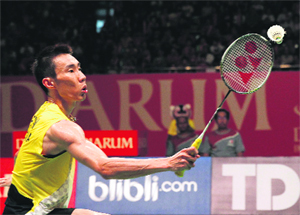 Malaysia’s top seed Lee Chong Wei won the Indonesia Open Super Series Premier men’s singles title for the fifth time, beating German Marc Zwiebler 21-15, 21-14 here Sunday. Unseeded Zwiebler was no match to Lee, who had won the tournament in 2007, 2009, 2010 and 2011, as the 30-year-old Malaysian wrapped up the final match in just 40 minutes, reports Xinhua. “I hope I’ll come back here next year. Next I would focus on the Asian Games, Commonwealth Games and, hopefully, I can still play in the 2016 Olympics,” Lee said, after receiving $52,500 as prize money. Lee had considered retirement after the London Olympics but is still aiming at the gold medal in 2014 Asian Games in Incheon, South Korea, to gloriously end his remarkable career. The fitter and faster Germans completely dominated the match with the Indians left to defend their citadel in their own half for most part of their last Pool B match. The Indian backline had a busy day in office as they had to defend the rampaging Germans who combined well and changed flanks in great pace to unsettle their opponents. Janne Muller-Wieland (14th), Maike Stockel (22nd and 44th), Marie Mavers (35th), Jennifer Plass (49th), Lydia Haase (54th) and Hannah Kruger (67th) scored for Germany. Vandana Katariya scored the lone goal for India in the 43rd minute. Fifth-ranked Germany got five penalty corners from which they converted two. India, ranked 12th, got two penalty corners which they could not convert to any goal. Montmelo, Spain: Yamaha’s Jorge Lorenzo trimmed the gap to championship leader Dani Pedrosa at the top of the MotoGP standings to seven points when he stormed to victory at a sweltering Catalunya grand prix on Sunday. The Spanish world champion beat compatriot and Honda pilot Pedrosa to the first corner and pulled away in the latter stages to win by just under two seconds. New Delhi: Grapplers Pradeep Kumar (60kg) and Sumit (96kg) won gold today in the Junior Asian Wrestling Championship as India finished with a rich haul of 17 medals at the competition played in Phuket, Thailand. Besides two gold medals on the final day, Indian grapplers won two silver and a bronze to finish at the top of the freestyle team rankings of the championships.